He finally popped the question and you said ‘yes’! Wowie, can you believe it? You are getting married! What was the first thing you did after you were engaged? Probably checking the internet for dresses and tips and tricks when planning a wedding. Well, maybe I can help you a bit with that as, in the meanwhile, I have become quite the ‘professional’ wedding planner myself. That is, my husband and I arranged quite a bit ourselves for our own wedding, I have attended many weddings and as I’m writing this blog, I’m also helping one of my best friends plan her wedding. So, therefore I have searched the internet and found some really helpful (no-nonsense!) websites for you to check out when planning your own wedding. Really helpful with different planning tips, DIY projects, inspiration and a lot of do’s and don’ts. Check it out! Really one of my favorites! The website contains everything you need to know when planning your wedding. Everything from planning tools, local vendors, dresses and a lot of advice regarding do’s & don’ts. Definitely check it out when planning to tie the knot! Perfect website when planning your wedding. A step-by-step guide how to ‘Plan your wedding’. Really love the way it looks and the way it is written. Not too many distracting photo’s, etc. Very straight forward, quickly go check it out! 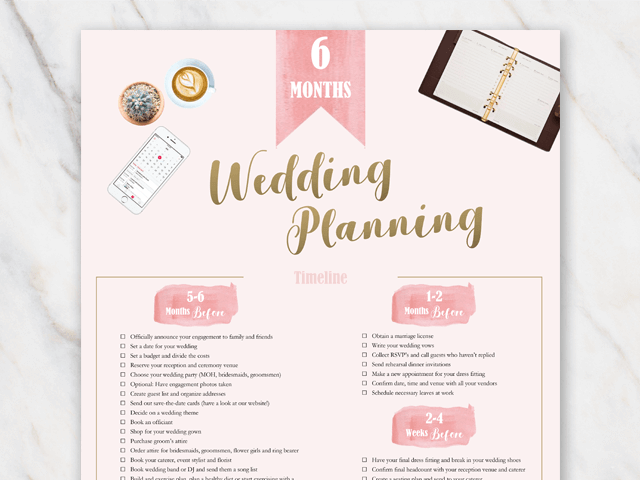 They have a whole section on ‘planning’ which can be very useful when you are just engaged or when you are already a bit futher on in the process. Also the ‘Etiquette + advice’ section is very useful! Every day they have a ‘tip of the day’, they can be really inspirational! A lovely website with a very crisp look and feel, easily to find your way around. But one blogpost is a must-read for all engaged couples, check it out here. Just like brides.com, Brides Magazine has a really good, step-by-step wedding planner guide. It starts 12 months prior to the big day and is divided per month. Really easy to follow and it has some good insights that you probably didn’t think of yourself! Check it out! The website is already so beautiful! A lot of light pictures, what gives the whole website a romantic vibe. I get so inspired when browsing through the website. You will find the newest collection of wedding dresses here, but also planning and advice, vendors they love, registry lists, etc. Get inspired and styled by Style Me Pretty! Love the part with ‘real weddings’. They have featured so many wedding in different categories. For instance under 10K, 15K to 20K, barn weddings, pastel weddings, festival weddings, etc. As we had a pastel & summer wedding, I can really relate to some of the stories. Ideal website when you are getting married! Such a fab website! Especially have a look at the ‘handcrafted’ section on the page, such lovely ideas to DIY! And also check out the ‘real weddings’ section, such a lovely photos from different weddings. It’s all about fab inspiration! All about pretty details, you instantly fall in love with Snippet & Ink when visiting the website. Have a look at the ‘signature series’ on the website and then go to the ‘traditions’ section. You will get so inspired by it! Perfect when you are a real DIY bride. They offer free printables, wedding resources but also some nice planning tools. Check the DIY projects, you’ll be amazed by all the things you can create yourself, and in the end it can save you a lot of money! Of course there are many more wedding websites where you can find more tips & tricks, but for now I think you will have enough inspiration to start planning. And of course don’t forget to check out Pinterest!